This full length 9 hole executive golf course located in Fort Erie Ontario offers guests a challenge with all the hazards including trees, bunkers, ravines, small greens and a variety of elevation changes. The full sized Par 36 3370 yard golf course offers a mix of Par 4’s, Par 3’s to test your short and mid ranged approach games as well as your long range game with the two Par 5 holes. Although the fairways are generous and wide, there are some hazards including a few water hazards that make this course difficult to play. Originally opened in 1932 and designed by the famous Canadian golf course architect Stanley Thompson, the Rio Vista Golf Course has been proud to offer both quality and affordable public golf for over 70 years. This “hidden gem” in Fort Erie has been slowly matured to become one of the best golf courses available to the public in the Niagara Region. Owned and operated by J.C.I. 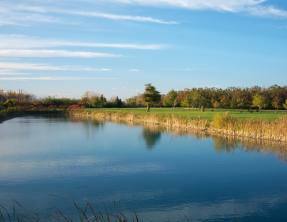 Fort Erie, the 9 hole golf course continues to be one of the most affordable courses with availability when you want. Special engagements, fundraisers, tournaments and corporate events are invited to the Rio Vista Golf Course. With a newly renovated clubhouse to offer a big screen television, extensive menu and fully licensed bar & patio overlooking the magnificent golf course.